For the past few weeks, I have been leading a Bible study on the Gospel of John. We have been working our way, verse by verse, through this most important Gospel. John’s Gospel has always been a favorite of mine. He does not write from a position of names and places and dates but rather a story if spirituality. John’s image comes from above the whole picture, and so we get a bird’s eye view of everything that is going on. John writes as someone who has listened to the heartbeat of God. This comes from the image of John leaning on the chest of Jesus at the Supper in the Upper Room. When Scripture is studied in context and verse by verse way things tend to jump out, that may be obscured in another study and the Wedding at Cana is one of those stories. On the third day, there was a wedding in Cana of Galilee, and the mother of Jesus was there. Jesus and his disciples had also been invited to the wedding. When the wine gave out, the mother of Jesus said to him, “They have no wine.” And Jesus said to her, “Woman, what concern is that to you and to me? My hour has not yet come.” His mother said to the servants, “Do whatever he tells you.” Now standing there were six stone water-jars for the Jewish rites of purification, each holding twenty or thirty gallons. Jesus said to them, “Fill the jars with water.” And they filled them up to the brim. He said to them, “Now draw some out, and take it to the chief steward.” So they took it. 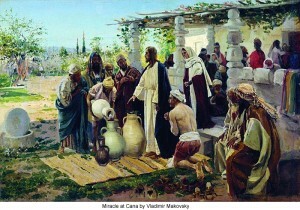 When the steward tasted the water that had become wine, and did not know where it came from (though the servants who had drawn the water knew), the steward called the bridegroom and said to him, “Everyone serves the good wine first, and then the inferior wine after the guests have become drunk. But you have kept the good wine until now.” Jesus did this, the first of his signs, in Cana of Galilee, and revealed his glory; and his disciples believed in him. After this he went down to Capernaum with his mother, his brothers, and his disciples; and they remained there a few days. What we see here is the first of the seven signs (we can also call them miracles) that John will write about in his Gospel. The setting of this story is necessary. In the Old Testament, the marriage feast was a symbol of the union of God with his bride Israel. Cana, located in Galilee, had a large Gentile population and sign that the Gospel would reach to the ends of the earth. The wedding took place on “the third day” this sets a resurrection tone to what is going to follow. In this passage wine is symbolic of life, and there is a double meaning to Mary’s statement that “they have no wine.” First, marriage is not complete without the presence of Christ in the lives of those who are married and second the old covenant was unable to bestow everlasting life even on the most faithful of people. This story is a bridge passage or an ending and a beginning. When the discovery that they had run out of wine is made, Jesus tells the servants to fill the empty stone pots with water. These pots have a great significance to the story. They are made of stone so as not to be ruined by ritual impurity according to the Jewish law. There are six of them, six is an imperfect number, seven is a perfect Scriptural number, and this indicates that the law, the very law that would make these pots impure, is imperfect and incomplete, and unable to bestow life. This water, the water of the law, is changed into wine symbolizing that the old covenant has been fulfilled in the new, perfect, covenant of Jesus Christ and this new wine will bestow life on all who drink it. But we cannot stop there. There is an overabundance of this wine, “they filled them to the brim” so that as they drew the wine out it spilled over the sides. Here we see the overabundance of the grace that Christ grants to all. This is but one example of Jesus pointing out that the old covenant has been fulfilled in him, but sometimes one has to drill down a little deeper to find it. This entry was posted in Featured, Interior Life and tagged Spirituality by Admin. Bookmark the permalink.